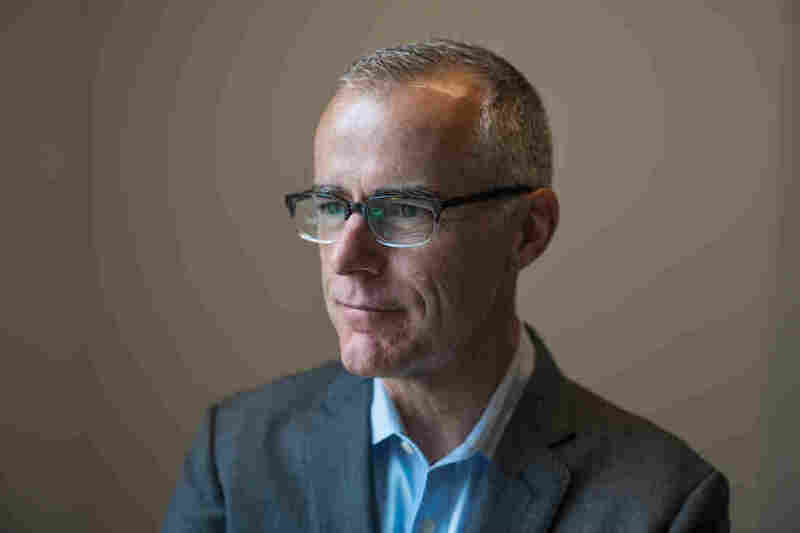 Andrew McCabe talked about his new memoir with NPR's Morning Edition. McCabe left the FBI after 21 years last March, when he was dismissed for an alleged "lack of candor" in a media leak probe unrelated to the special counsel investigation. While he declined to conclude that Trump or his advisers colluded with Russia, McCabe said the evidence special counsel Robert Mueller has made public to date — including new disclosures about an August 2016 meeting between former campaign chairman Paul Manafort and Konstantin Kilimnik, whom the FBI has linked to Russian intelligence — "is incredibly persuasive." The president and the White House also have focused their attention on McCabe's firing and what critics call the conflict of interest involved with McCabe's wife's political campaign — she ran unsuccessfully for the Virginia legislature as a Democrat. McCabe's new book, The Threat: How the FBI Protects America in the Age of Terror and Trump, describes the challenges and frustrations in interacting with the new president on sensitive national security matters. Exhibit A: an FBI briefing with Trump that had "gone completely off the rails from the very beginning." "Instead the president kind of went off on a diatribe," McCabe told NPR, explaining that Trump changed the subject to his belief that North Korea had not actually launched any missiles because Russian President Vladimir Putin told him that the U.S. intelligence assessment was wrong and that "it was all a hoax." "How do we impart wisdom and knowledge and the best of our intelligence assessments to someone who chooses to believe our adversaries over our intelligence professionals?" McCabe asked. McCabe became the FBI's acting director after his former boss, former Director James Comey, was fired in the spring of 2017. He returned to the deputy director role after Director Christopher Wray was confirmed that autumn. The atmosphere at the Justice Department was so panicked, McCabe said, that the new deputy attorney general, Rod Rosenstein, proposed wearing a recording device to collect evidence about Trump's intent in dismissing Comey. "I was taken aback by the offer," McCabe said in his NPR interview. "I told him that I would consider it, I would discuss it with the investigative team, and I'd let him know. I did talk to my attorneys back at FBI headquarters about it." "We all agreed it was a horrible idea and it was not something that we would pursue," McCabe said. "So while the deputy attorney general says he never authorized anyone to wear a wire, that is true — he never authorized it because we never asked him for that authorization." A man who fell in love with the FBI is now the subject of an ongoing criminal investigation for alleged false statements. A grand jury has been impaneled in the case but it isn't clear whether prosecutors will bring criminal charges. McCabe refused to engage in his NPR interview over findings by the Justice Department's inspector general, calling that report a "selective presentation of evidence and conclusions designed to reach the result the president was clearly calling for." Since the publication of excerpts and interviews surrounding McCabe's book have emerged, Trump has been tweeting to attack McCabe's credibility. That's just more evidence, argued the former deputy FBI director, that he was singled out then and he's being singled out now. But that's not just bad for him, he argued. "The thing that concerns me going forward is firing me 26 hours before my retirement sends an unbelievably chilling message to the rest of the men and women of the FBI," McCabe said. "It sends a message that if you stand up for what you think is right, and you do the right thing, and you honor your obligations to this organization and the Constitution, that you too could be personally targeted and lose those things that you've been building towards your whole career."